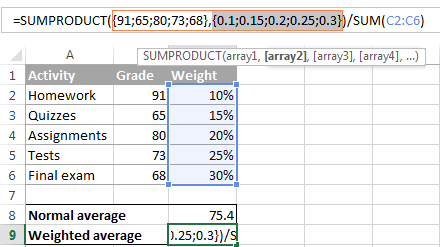 The tutorial demonstrates two easy ways to calculate weighted average in Excel - by using the SUM or SUMPRODUCT function. In one of the previous articles, we discussed three essential functions for calculating average in Excel, which are very straightforward and easy-to-use. But what if some of the values have more "weight" than others and consequently contribute more to the final average? In such situations, you'll need to calculate the weighted average. Although Microsoft Excel doesn't provide a special weighted average function, it does have a couple of other functions that will prove useful in your calculations, as demonstrated in the formula examples that follow. Weighted average is a kind of arithmetic mean in which some elements of the data set carry more importance than others. In other words, each value to be averaged is assigned a certain weight. 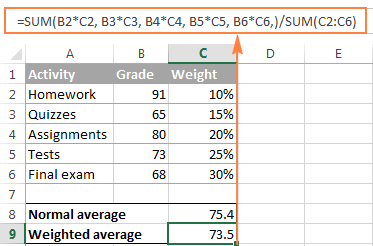 Students' grades are often calculated using a weighted average, as shown in the following screenshot. A usual average is easily calculated with the Excel AVERAGE function. However, we want the average formula to consider the weight of each activity listed in column C.
In mathematics and statistics, you calculate weighted average by multiplying each value in the set by its weight, then you add up the products and divide the products' sum by the sum of all weights. 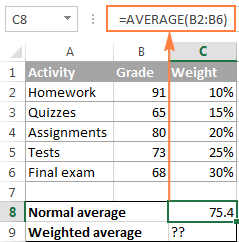 As you see, a normal average grade (75.4) and weighted average (73.5) are different values. 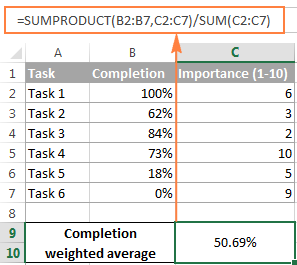 In Microsoft Excel, weighted average is calculated using the same approach but with far less effort because Excel functions will do most of the work for you. In essence, it performs the same calculation as described above, except that you supply cell references instead of numbers. As you can see in the screenshot, the formula returns exactly the same result as the calculation we did a moment ago. Notice the difference between the normal average returned by the AVERAGE function (C8) and weighted average (C9). Although the SUM formula is very straightforward and easy to understand, it is not a viable option if you have a large number of elements to average. In this case, you'd better utilize the SUMPRODUCT function as demonstrated in the next example. So, what the SUMPRODUCT function does is multiply the 1st value in array1 by the 1st value in array2 (91*0.1 in this example), then multiply the 2nd value in array1 by the 2nd value in array2 (65*0.15 in this example), and so on. When all of the multiplications are done, the function adds up the products and returns that sum. To make sure that the SUMPRODUCT function yields a correct result, compare it to the SUM formula from the previous example and you will see that the numbers are identical. Well, that's all about calculating weighted average in Excel. You can download the Weighted Average spreadsheet and try the formulas on your data. In the next tutorial, we are going to have a close look at calculating moving average. I thank you for reading and look forward to seeing you next week! 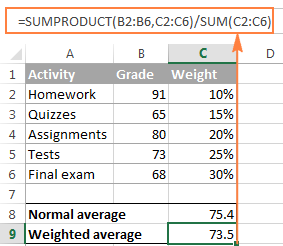 22 Responses to "How to calculate weighted average in Excel"
I'm trying to use the weighted average for a group of numbers between 500,000 and 999,999. Is is possible to use the weighted average for a range of numbers. If so, how? How would I modify this to take two different sets of weights into account? Would it be wrong to multiply the 2 weights for each row? Can you replace a cell by group name in a formula? let say column A = group name and column B = $. How do you average an amount for each group not using the A1:A...but instead using Group Name such as Grapes, Peach, etc..
Hi, I need to average a set of course works to the original value. Let's say the course work valued 60 points but I gave 5 pieces of assignments that valued 70 points and at the end of the semester I want to average them to the original value. Usually if a student say got a total of 55 out of 70, I would calculate 55/70 X 60 = 47. So the student would get 47 out of 60. How do I put that formula in excel? Would really appreciate your help, my class has over 60 students. A worker is rated on a 1-5 scale for 10 different measures and his overall skill rating is the average of these numbers. The problem is that 3 of the measures are triple weighted and to further complicate matters, its possible for a worker to not be rated at all on one of the measures. This means the value isn't a 1, but a null value not factored into the overall average so as not to penalize them. How would you formulate this in excel? Hi I have 3 employees ,,, And i pay a bonus each week for the staff member who gets in the most " new sales " or "new customers". Now i give a score of 1 point for new once off customers. for example . sales Staff Peter total new sale were 1000.00 and his point score was 7. Sales staff 2. John total new sales was 1200.00 and his point score was 5. Sales staff 3. Sam total sales were 800 and his points score was 9. So can you tell me who wins the bonus ? more than 10kg i charge every 10kg 3 euros. How would I make the first equation ignore 0% or blanks? So a bit more complex of a weighing that I need and I have struggled with it for a while. I basically have two separated weighted categories which each have 3 internal weighted categories but everything combines for one single score. I could not get the sum product function to align with the answer that populates from our automatic dashboard system . Hope you'll find this information helpful. How do I get the weighted aver per FY (total?